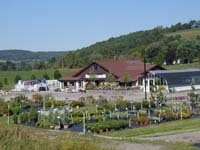 At Steuben Landscaping & Floral Center you’ll find everything you need to start or finish projects all year long. We offer a quality selection of hardy trees, shrubs, fruiting plants, hybrid shrub roses perfect for planting around your home, an extensive collection of perennials plus premium flower & vegetable bedding plants, hanging baskets, tropical & indoor potted plants & dish gardens in a variety of sizes – from tabletop to floor size. In spring, we’re your source for seeds & seed-starting supplies & summer-flowering bulbs; in fall you’ll enjoy the glorious garden mums grown directly at our nursery, and a rainbow of Dutch bulbs to bloom in spring. 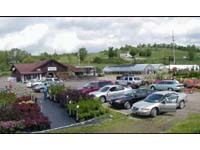 We carry a full line of garden supplies as well as a wide selection of garden decorations & accessories throughout the year: water garden plants & supplies, fertilizer, mulch, tools, trellises, obelisks, building stone, religious statuary, birdbaths, stepping stones, pottery, chimes, decorative indoor & outdoor signs & flags, wildlife supplies & more! Special orders are always welcome. Whether you’re looking for an engraved rock, name & address marker, or a specially designed filled urn or planter, it’s always our pleasure to serve you. Our staff includes horticultural professionals who will help you make your garden dreams come true. Looking for that perfect gift? Gift Certificates are available at Steuben Landscaping & Floral Center all year (no expiration date) - just call or stop in anytime. During the holiday season - November & December - our glass greenhouse is filled with poinsettias, Christmas cactus, fragrant cyclamen & stunning amarylli, plus a wide array of indoor plants. Fresh evergreen wreaths & garland are made on-site daily. Live potted evergreen trees & fresh-cut Christmas trees are available beginning the day after Thanksgiving. Browse our holiday gift shop for "heirlooms" to pick up for family & friends; we even provide a "Gifts for Gardeners & Nature-Lovers" list to help you find the perfect idea for that special person on your shopping list. Hope to see you soon! 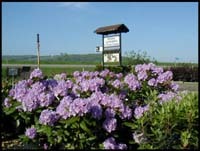 Check out some more Photos of our Garden Center! Our Guarantee All cash ‘n carry trees & shrubs are guaranteed for one full year from date of purchase; these same plants carry a two-year guarantee when installed by our professional landscape team. Annuals, roses, perennials & fall mums are guaranteed for the entire growing season. Plants are not guaranteed against drought, flood or animal damage. The original plant plus the corresponding original sales receipt must accompany replacement claims. A plant will be replaced once. Replacement plants are not guaranteed.